That is wide receiver Johnny Forzani. He is an intriguing prospect coming out of the Calgary Stampeders youth organization (Canadian teams have those I guess?) and is supposed to be quite the speedster. As you can see he wasn’t moving too fast today. Apparently this is nothing major, just soreness in a surgically repaired foot. They were also being cautious and resting a couple other guys who had off season surgeries including Bernard Wolfgramm and Myron Beck, but for the most part everyone was participating. What a difference a year makes. 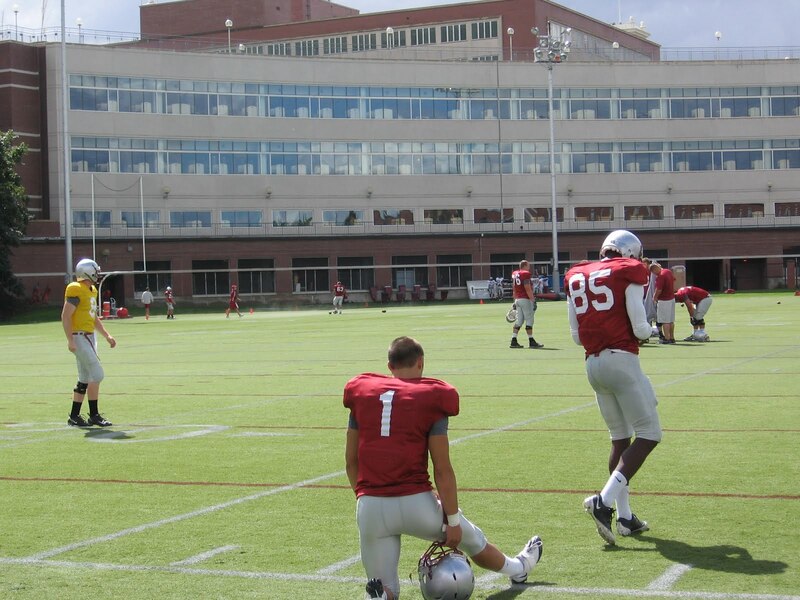 As you may have heard, two true freshman have been participating in afternoon practice with the veterans. Gino Simone, the all world receiver from Skyline and Travis Long, the man-child defensive end from Gonzaga Prep were both on hand. Here is Gino (1) stretching before practice with NCAA 400 meter hurdle national champ, Jeshua Anderson (85). One player who returned to practice today after sitting out yesterday with a hip pointer was Apple cup hero Jared Karstetter (84), seen here with Kevin Lopina (9). I’m not sure if it was a last minute decision, but when he ran onto the field the receivers and QB’s got excited, welcoming him back with a burst of applause. It was clear watching the offense go through their plays that they have a much better grasp of things than they did at this time last year. Last summer the coaches spent a lot of time shoving guys into the right places, basically directing traffic, but this year, with the notable exception of Simone who is still learning the formations, everything was much more fluid. Most of what I saw from the coaches was fine tuning and pushing the tempo. If you’re like me, you were probably frustrated by the pedestrian pace of our no-huddle offense last year (the few games we actually ran it). But I’m hopeful from what I saw Thursday afternoon that we’ll be able to step up the pace a bit more. You may have gotten the idea from some of my posts and comments that I am a big fan of Joe Eppele. When you see this team in person, he is without a doubt the biggest, strongest looking guy we have and I was excited to see him in the mix for a starting spot this year. 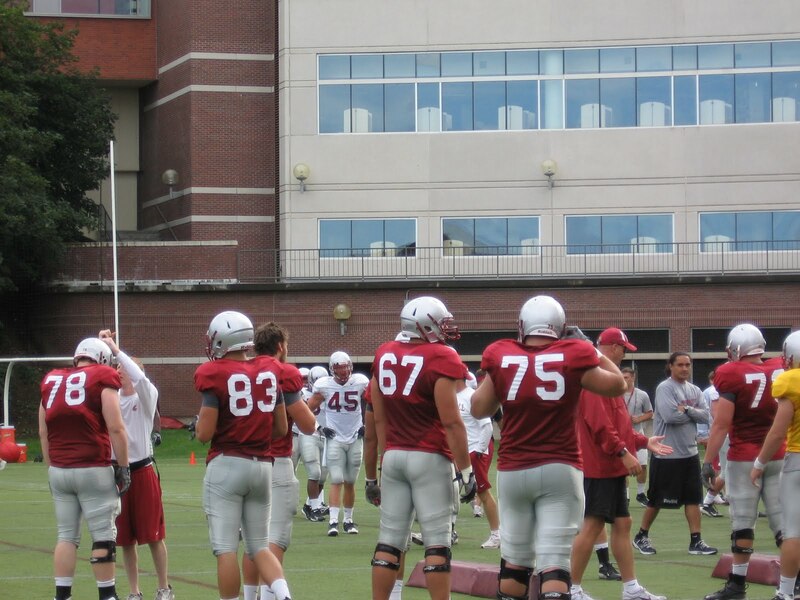 Here is big #67, who doesn’t look to carry an ounce of body fat on his over 300 lb frame. I took this picture to show how much he stood out amongst the other hosses on the team, but depth perception and my photography skills being what they are, you may be asking… who is #75? He looks like a behemuth! Well he is. That is redshirt frosh Tyson Pencer, who like Eppele, hails from British Columbia and is one of the growing number of guys who make us look like a PAC-10 football team. In the picture above you see the coaches have laid foam pads about 3 yards apart on the turf. This set up was for a drill that was my favorite part of the day. As Vince highlighted in his report, this is a drill borrowed from Bud Wilkinson of Oklahoma. An offensive lineman and defender faced each other between the pads with a QB and/or running back behind the O lineman. The idea was for the O lineman to open a hole for the running back to get around the defender within the tight confines between the pads. Basically, it was demolition derby. There were some big collisions, the most notable I saw was when Joe Eppele lined up against Andy Mattingly. It was a pretty one sided affair as Eppele completely bulldozed Mattingly to an explosion of cheers from his cohorts on the offense. Also of note was true frosh Travis Long completely blowing up the O linemen he was up against and the running back in a single big hit. It is easy to see why this young man may see the field right away! The other big moment of the afternoon was a long touchdown run in scrimmage from Logwone Mitz. He made a great cut when a hole opened off tackle left and was through it like a laser and out in the open where no one would catch him. As Grippi noted he got some nice blocks from his receivers, but from my vantage point all I could see was pure explosiveness. He looked like Shaumbe in the snow. 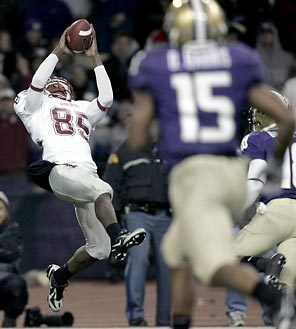 Know what I mean, Coug fans? So Who’s Going to Pick it? So we’ve taken a peek at who we think is going to chuck it, and who we think is going to carry it. 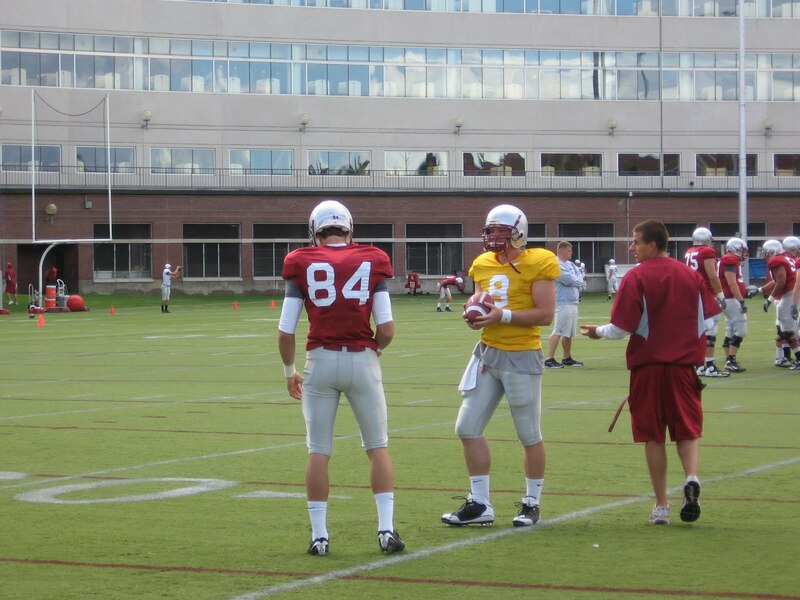 Now let’s look at who, exactly, will be picking balls out of the air for the WSU offense in ’09. Right away, it must be acknowledged who WON’T be picking it in ’09, and that is of course, our lead photo guy of the day, Brandon Gibson. For the first time since 2004, the WSU receiving corps will be sans #4 (2005, 2006, 2007 and 2008 all saw Gibson in the WR rotation). One of the all-time greats in WSU history, Gibson finished his career as the school leader in receiving yards (2,756). He was second in total catches with 182. His 17 TD’s placed him in the top six in school history. Gibson will be missed, there is no denying that. 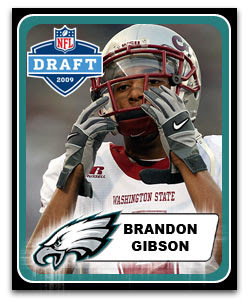 Gibson, as you are probably aware, was a sixth-round draft choice of the flying Philly Eagles, ready to make some noise back east. We salute you Gibby, and wish you all the best in your future endeavors. But the page must be turned, so with that, we look ahead. And who shall lead them? Let’s see…. While 2008 was, overall, a lost season for many WSU WR’s, the raw numbers are a hard thing to comprehend. It seemed like nobody, and I mean NOBODY, improved at WR in ’08. After all, the superstar game-breaker in Brandon Gibson saw his numbers shrink considerably, going from a 67-catch, 1180-yard, 9-TD campaign in ’07 to just a 57 catch, 673-yard, two-TD campaign in ’08. But, believe it or not, there was someone who improved last year, even with an offense that struggled so terribly for the bulk of the season. The one guy who did improve, at least statistically, was none other than the track star – Jeshua Anderson. Wait, you mean the amazing hurdler who flirted with making the 2008 Olympic Team, and then missed all of August with an abdominal injury? THAT Jeshua Anderson?? It’s true. After catching just 12 balls as a true frosh in ’07, Anderson emerged with 33 catches in ’08. His yards-per-catch was down in a huge way, at 9.2, but after ’07 there was nowhere to go but down. Anderson averaged an unrepeatable 31(thirty-one!) yards per grab in ’07, but that was on just the 12 catches. There was virtually no way he was doing that again, not as a starter after playing the deep threat role the year before. I guess our concern with Anderson is the same one that a lot of people have for him, and that is has the track time taken away from his chances to get better on the football field? After all, he missed spring ball again this year to compete in the NCAA championships, where YES, he did repeat as NCAA CHAMP in the 400 hurdles. So as great as he is on the track, nobody can really blame him for missing practice time on the gridiron. He is super-special in the hurdles, and a lucrative career may await on the track-n-field circuit once his NCAA days are behind him. Anderson does possess some good tools for the WR position, aside from just the great speed. He is cut at 6-2, 188, and shows good hands and excellent body control. But is he good enough at his craft to be THE MAN this year? He could be on the brink of a major breakthrough, or the load could be unbearable for a guy who may not exactly be ready to roll as the number one WR. But without question, Anderson is the fastest, most talented WR of the bunch coming back in ’09. Here’s hoping a healthy, productive practice session in August will see him ready for the rigors of a 12-game gauntlet in ’09. Now it gets a little challenging, as what you have left is a real mash-up of young, somewhat experienced WR’s, but none of whom has really had a shot to make some noise. Of course, we love Jared Karstetter, and he will always live in Apple Cup lore for his 48-yard grab that saved the 2008 game. But aside from that catch, he made just FIVE others the entire ’08 season. But that was his true frosh year, and he did only start three games on the season. Excellent size at 6-4, 203, and pretty athletic as well, he could evolve into a difficult match-up for whoever he faces on a weekly basis. Last year we hoped he could turn out to be another Jeff Samardzija of sorts, the former Notre Dame great turned MLB reliever? Samardzija was your bigger, possession-type target with good hands, but also good enough quicks to break one here and there. Karstetter is going to be an interesting guy to watch this year as we see if he’s taken a step forward in his development. The opportunity is there, no doubt about it. But the jury is, as they say, still very much out on Karstetter. Another kid with a year of playing time now under his belt is Kevin Norrell. On the smallish side at 5-9, Norrell showed a little something with 11 catches last year. He’s perfect for the slot, and should be able to use his quickness in space against linebackers or safeties who line up across from him. But still a youngster as a true sophomore, like Karstetter, a long way to go before he’s a complete product. Another WR to watch is Daniel Blackledge. Blackledge had a semi-good start to the ’08 season, but after eight catches in his first four games last year, he only had ONE catch the rest of the way. Built similar to Jeshua Anderson at 6-2, 179, Blackledge obviously doesn’t have the take-your-breath-away speed of Anderson, but he’s still a very good athlete with decent wheels. Hard to believe he’ll already be a junior this year, but they really could use his ability to get the ball down the field. Outside of Anderson, he is probably the second-best deep threat on the team. Finally, the newcomers. Johnny Forzani, the Canandian prospect; Gino Simone, the heralded recruit; and Jeffrey Solomon, the transfer from Eastern. First, Forzani. Who knows, really, what they got here. Most likely you know the back story already – but if you forgot, check out this link. 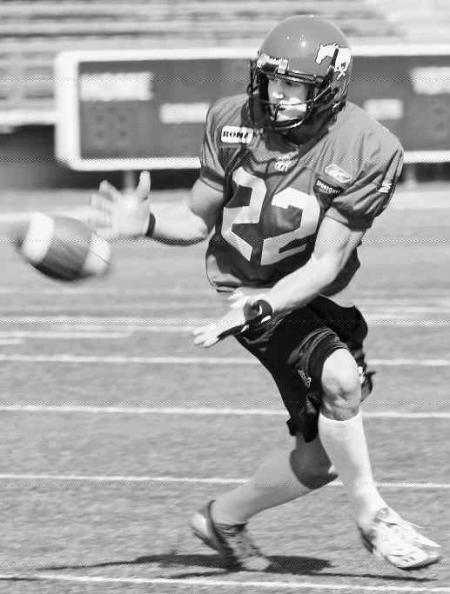 He didn’t play high school ball, has some family CFL ties, and even though he was known more as a hoops player, he ultimately makes the practice squad of the Calgary Stampeders. Decent size at 6-1, 195, and really good speed as well, reports are he still has quite a ways to go before he is ready to make an impact. 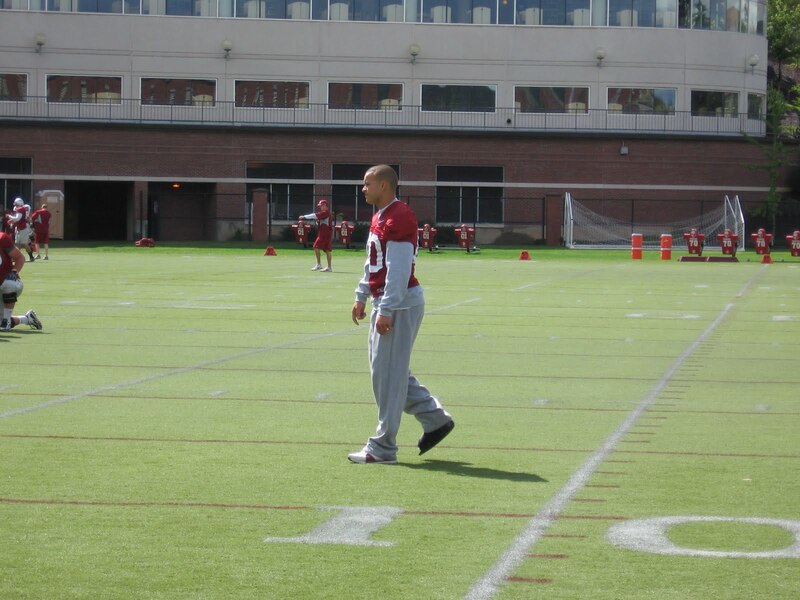 He is rough around the edges, but given some solid practice time with WR coach Mike Levenseller, anything can happen. Maybe they’ll catch lightning in a bottle? If anything, split him out opposite of Jeshua Anderson and send him deep with that 4.4 speed! Simone is well-known in these parts. Regarded as the top player in Washington last year, he has a chance to get some real PT in ’09. Not huge, but big enough at 6-0, 170, Simone’s game is all about precise routes and excellent hands. NOT a big highlight reel guy and he’s not a speed demon, but he was as productive as can be in high school, where Skyline won the 4A state title in a pass-happy offense. Solomon is a real under-the-radar type guy, but could be something when the dust settles. Another six-footer, and 196 lbs, he sat out last year after coming in from EWU. 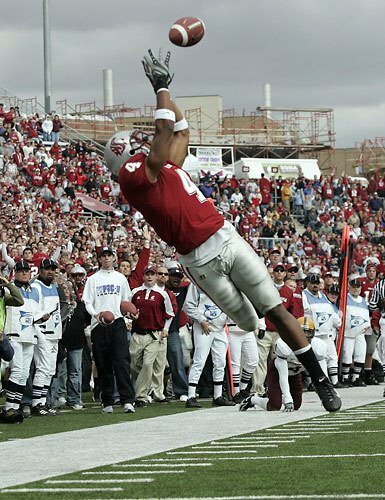 He had an injury that forced him to miss the ’07 season, but ’06 as a true frosh he was somewhat productive under Wulff at EWU, playing in nine games that year. He only caught seven balls as a true frosh, but definitely showed enough to follow Wulff to Pullman. Keep an eye out for him in practice reports next month. That’s about it for the WR spot. It’s kind of a weird position, where the superstar is gone, but there is young, somewhat experienced guys waiting in the wings? But that said, there are an awful lot of “IF’S” here to hang your hat on. IF Anderson is healthy and improves; IF Karstetter continues to get better and learns how to use his size and athleticism as weapons against smaller defensive backs; IF Norrell is used properly in the slot and they can take advantage of mismatches with his quickness. Etc, etc, etc. But I do believe this position will be better in ’09 compared to last year. At least it looks like it has that proverbial “upside” tag, as long as health doesn’t become an issue (quick, knock on anything resembling wood!). Just remember, last year at this time, yeah, they had Brandon Gibson. But Jeshua Anderson was hobbled with an injury, Daniel Blackledge had ONE career catch coming into ’08, and both Karstetter and Norrell were true frosh! Those four – Anderson, Karstetter, Norrell, and Blackledge – will be the biggest factors in the passing game this season. And all four now have another year under their belts. So they should be a stronger, deeper, better unit in ’09. But it may still not be enough to stop another tough season. Now for 2010, wow, can we talk?? But for now, we’ll settle for improvement and consistency on a weekly basis! That’s it for a Thursday. ENJOY IT, as always, and GO COUGS! Some pretty good stuff floating around so we’ll get right to it. Cougfan had a good look at the Canadian sleeper, Johnny Forzani. He really is an interesting story. Have you ever seen such intrigue with a kid who didn’t play a down of high school football, yet has already garnered three-star ratings out of Scout.com? But the hype seems somewhat deserved in this case, and it is a special one. A hoops standout who caught serious attention with the football videos he sent around, he showed up at a tryout camp for the Calgary Stampeders junior team and blew them away with his size (6-1, 204), athleticism, and speed (4.37 to 4.45 in the 40??). “On Forzani, you notice first how quick off the line he is,” says Brandon Huffman, Scout’s West Coast analyst. “Some receivers don’t utilize their first step right but that’s not the case with Forzani. Nice! But that’s not all. There was also a pretty good read about Forzani and his father, John, a former CFL WR who made a good living playing Canadian ball. The whole idea of wearing his father’s number for the Calgary team, wow, that’s pretty cool. He’s got the bloodlines, that’s for sure, and you have to wonder what will happen once coach Levy gets his hands on this kid. I know, I know, you don’t want to get too jacked about a recruit. But doesn’t he look like your turning-over-rocks type guy who you get through hard work and thinking outside the box?? These kinds of stories, they are just the kinds of things we can probably come to expect out of the Wulff regime, don’t you think? Meanwhile, on the theme of offense – an anonymous poster informed us that he spied none other than Ocho Rojo, Marshall Lobbestael, on campus yesterday. Big deal, right? Well, he was WITHOUT crutches. Certainly a better sight compared to last fall…. I tried checking it out today but didn’t hear much that isn’t already known. He will be EXTREMELY limited in spring ball and likely won’t truly be part of full practices until the fall. If he does get out there in the spring, it will be very, very light work. But the early word is things are looking pretty good. 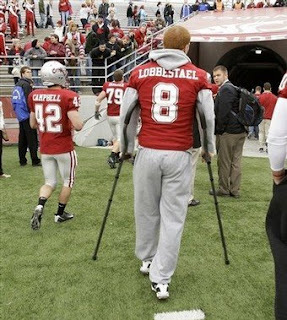 While it will make for some good bar-stool chatter, and it should be an interesting QB derby this fall, I would bet the majority believe that if Lobbestael is healthy, he will be THE GUY in ’09? I sure would love to see him ready to go by August and really compete hard for the job against JT Levy and Kevin Lopina. Most of all, let’s hope whoever the hell wins that job gets the full keys to the car so to speak. You know, like MORE than 50% of the playbook? You’ve all at least been in the system for a year, now let’s see what happens! The Evergreen weighed in on the ’09 schedule. Not a bad look at next season, and they even take a shot at UW: “The Apple Cup concludes the regular season Nov. 28. The Cougars will head to Seattle this year, hoping to build a three-game winning streak against a Husky team that has a new head coach, a new system, but the same mediocre personnel.” So there. Oh, and hey, they even throw out a PREDICTION – 5-7? Really? Maybe it’s just me, but doesn’t it still seem WAY too early for predictions in January? Don’t we need to get through signing day and spring ball, at the very least, to see the way these teams are going to be? You know we will weigh in this spring, and that means a return of the “fishwrap” series where we look at each 2009 opponent. We’ve made a few changes around this here blog. First of all you might have noticed the “click here for more….plus Comments”. Kind of a cool little feature, it helps keep the front page of the site without too much scrolling for stories. Plus it gives you a jump right to the comments of each story, making it easier for YOU to weigh in. We also put a “latest comment” feature to the right of the page, if you scroll down below the Spokesman Review feed. It shows you the last five comments posted to the site. Interested to see if anyone responded to what you said? Just check there. Finally, many of you already know this, but signing day is next week….Seriously. There is a free function in Spokane on the 4th, followed by a deal in Shelton on the 5th and the Seattle dinner on the 6th. We will do what we can to get some great coverage, one way or another, and provide the best recap available! But if you attend one of these functions and hear or see something pretty cool, by all means, you are welcome to share it here. The more tidbits we can pass along the better. We’re all in this together….right?? That’s it for now. ENJOY YOUR EVENING, and GO COUGS! You are currently browsing the archives for the Johnny Forzani category.